We at The Rug Shop know that trends and styles are an integral part of decorating a home. 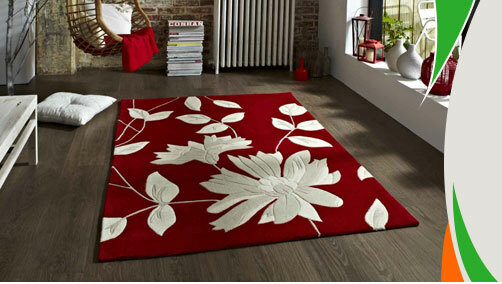 We have an exclusive range of red and orange rugs which are available in different sizes and shapes. If you are looking for a specific type of material to suit your style like wool, polyester, or polypropylene then we ensure you that you will not be disappointed. Choose the shade you think will strike a perfect balance between the rug and your room setting. Red is a color associated with happiness, celebrations and good luck. It keeps the negatives vibes away from a room. Using a lot of red in your home decoration tends to demonstrate a lot of aggressiveness and hyperactivity. The best way to utilize this color is to get a red rug which is the centerpiece of your flooring. It will be the main focal point and at the same time keep the mood alive and active. Red is always and best optimized as an accent color. Hence using it in small amount like a rug maintains the balance of your room. In the concept of interior designing, making use of bright red in your home interiors reduces the size of the room and increase the size of the objects. Choosing the right color is important when it comes to rugs as their placing on the floor mostly takes the space where you can’t avoid but to have a look at it. It also helps in defining the mood of the room and give some clue on our own personal style as well. A red or orange rug tends to uplift the mood of any room due to their inherent vibrant quality. A red or an orange rug would add warmth to your home décor. We need to keep our main theme color in mind when choosing a red or an orange rug as too bright a rug in red or orange will overpower the room balance and may look awkward. Hence we have various shades available in red and orange complimented by right texture to suit your requirement. Do not worry about the price. Our rugs are the most inexpensive and cheap you will find anywhere online. We are so confident of our competitive prices that we offer a price match guarantee. We value your personal taste and look forward to your association with us for many more years to come.